Llanelli received a visit from the Luftwaffe on one occasion when bombs were dropped on the sand dunes adjacent to the North Dock. The explosion broke windows of houses in the Seaside area and the resulting fire lit the sky for miles around. The location was in fact a camouflaged petrol dump containing a large quantity of fuel stored in metal cans beneath the dunes. The site of the bombing was a narrow peninsula of sand extending for half a mile from the dock to a small wooden lighthouse at the end of the breakwater. The Ordnance Survey map shown demonstrates how, in 1940, German intelligence had superimposed details of the dock area. Llanelly Mercury 14th June 1945 page 3 Column 4. The date of the actual bombing was 24th September 1940. 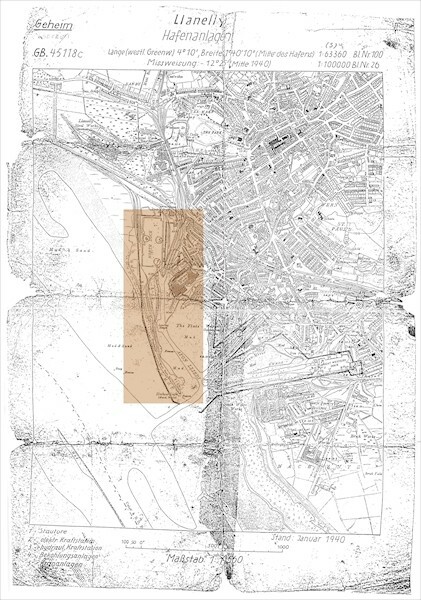 The sepia area of the map shows the peninsula with the North Dock at the top. Note the numbers against the dock superimposed by the Germans. At the tip of the peninsula is the small wooden lighthouse.